This is a latched small parts box with a snap hinge. 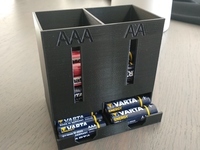 This is a variation of another box I designed but without the need for any hardware or tools to assemble (https://www.thingiverse.com/thing:3429552). 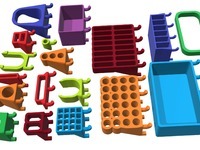 Useful for organizing and storing small piece like screw, nuts, resisters, etc. The lid is flush against the top of the base so it can be jostled or turned upside down and everything will stay in place while the latch keeps the lid closed. The thumb pads on the lids and base on the front side of the box to make it easier to open and close. To attach the lid to the base carefully by pressing the "pegs" on the lid into the hinges on the base(see screenshot). The "pegs" on the lid will be "bridged" during printing and as such, the bottoms might droop a little and be a little misshapen. If the lid does not pivot smoothly in the hinge, remove the lid and, with a hobby knife or something similar, remove a little bit of plastic from the underside of the "pegs" on the lid. This should let the lid pivot more smoothly. This was my second attempt at using Fusion 360 to design something functional. Please be kind, but constructive comments and recommendations on how to improve the design are greatly appreciated. 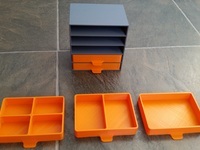 I was also inspired by bnimon's Screw and Bolt Box, hinged with snap lid(https://www.thingiverse.com/thing:3428662) to make a version of my original box with a snap hinge. Someone much smarter than me probably knows how to make this a customizable object where the user can pick the number and/or configuration of the compartments. If anyone has any thoughts or wants to collaborate on this, let me know. The nubs on lid's latch piece can break if you use too few perimeters, infill, or top and bottom layers. I recommend a 3-4 perimeters, 4 top and bottom layers and around 30% infill on the lid to make sure the latch doesn't fail. I didn't have any issues with the base at lower perimeters, infill, etc. If the latch doesn't close easily at first, remove some of the plastic from the nubs on the lid's latch piece using sandpaper, hobby knife, file, etc. Pressing too hard can break the latch but once you've removed enough plastic to make the latch close with only a moderate amount of pressure, you're good to go!